In the wake of the 2011 revoluti0n and July 2013 military takeover, Egyptians still support the concept of democracy, believe democratic values are important and prefer democratic governance. But, there are some signs that their enthusiasm for democracy is slipping, and that stability and a strong leader are becoming greater priorities. Generally, supporters of last year’s removal of President Morsi are less supportive of democratic governance compared with those who oppose Morsi’s ouster. While most Egyptians still believe the country’s legal system should be influenced by Islam, the number of people who think laws should strictly follow the Quran has fallen significantly over the last year. 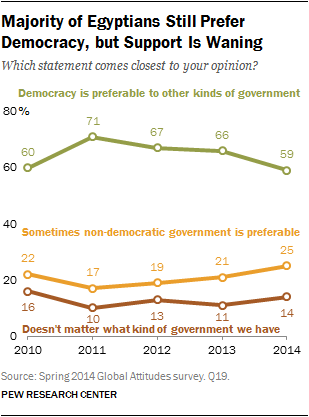 Roughly six-in-ten Egyptians (59%) believe that democracy is preferable to any other kind of government, with a quarter saying in some circumstances a non-democratic form of government is preferable, and 14% saying the type of government does not matter. Support for democratic governance is down from the 66% who said it was preferable in 2013 and the 71% who said so in 2011, just weeks after the revolution. 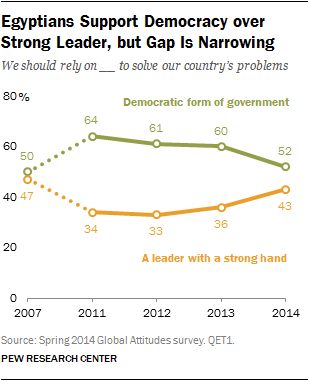 Since that time, Egyptians have also shown slightly more acceptance of a non-democratic government. There is a significant gender gap on preference for democracy. Nearly seven-in-ten Egyptian men (67%) think that democracy is preferable, while only around half of women (51%) agree. Roughly three-in-ten Egyptian women (29%) say that non-democratic government is preferable in some circumstances, with a further 18% saying that the type of government does not matter. Only 21% of Egyptian men think not having a democracy can be preferable and an additional 11% think it does not matter. About half of Egyptians (52%) now say that to solve their country’s problems they should rely on a democratic form of government, while 43% think that a leader with a strong hand is the best way to deal with Egypt’s myriad challenges. In the aftermath of the 2011 overthrow of President Mubarak, nearly two-thirds (64%) thought a democratic form of government was the proper solution for Egypt’s woes, with only around a third (34%) favoring a strong leader. Preference for a democratic government versus a strong leader is related to views of the 2013 military removal of President Morsi, as well as attitudes towards the Muslim Brotherhood and Abdel Fattah El-Sisi. Egyptians who favor the 2013 overthrow of the government and have a favorable view of Sisi also show greater support for strong leadership. On the other hand, those with a favorable view of the Muslim Brotherhood are much more apt to say a democratic form of government is the best way to tackle Egypt’s problems. 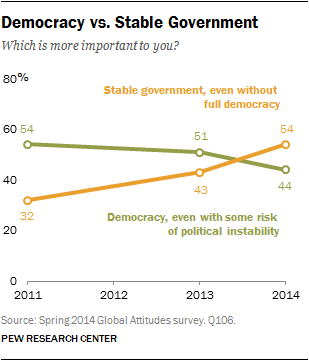 The Egyptian public is split on whether a good democracy (49%) or a strong economy (49%) is more important to them. Views on this question have remained relatively stable since 2011. Poorer Egyptians are more willing to give up good democratic rule for a stronger economy. Only 31% of lower-income Egyptians say that they would chose a good democracy, with 66% wanting a stronger economy instead. High-income Egyptians are split on whether they prefer good democracy or a strong economy. Additionally, Egyptians who opposed the 2013 military takeover (56%) are more inclined toward a good democracy than those who supported it (44%). When asked about the tradeoff between democracy and stability, a narrow majority of Egyptians (54%) now say that having a stable government is more important, even if there is a risk it will not be fully democratic. Just 44% believe it is more important to have a democratic government, even if there is some risk of political instability. This is greatly changed from 2011, when 54% of Egyptians thought democracy was more important, compared with the 32% who prioritized stability. Just in the last year, support for a stable government is up 11 percentage points, while the percentage preferring democracy is down seven points. 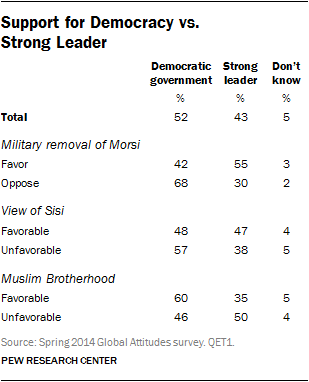 Majorities in Egypt say that values commonly associated with democracy are important for Egypt’s future. However, strong support for these values ranges from 79% who say that a fair judiciary is very important for Egypt’s future to just 26% who say that a civilian controlled military is very important. Overall, 82% say that improved economic conditions are very important for Egypt’s future. And nearly eight-in-ten (79%) say that a judicial system that treats everyone in the same way is very important. Similarly, 63% of Egyptians say law and order is critically important to their country’s future. 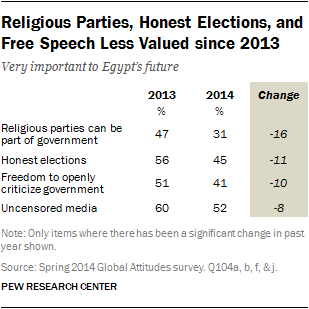 Fewer Egyptians think that an uncensored media (52% very important), honest elections (45%), and freedom to openly criticize the government (41%) are essential for Egypt’s future. And support for these fundamental democratic rights has diminished in the last year. Less than four-in-ten say having the same rights for men and women (37%), freedom of religion for religious minorities such as Copts (32%), and allowing religious parties to be part of the government (31%) are very important. The importance of having religious parties in government has dropped 16 percentage points since 2013, the steepest drop among any of the democratic values asked. Over the last few years, Egypt has experienced multiple mass demonstrations, but the freedom to protest peacefully (29% very important) ranks relatively low on the list of democratic values respondents believe are important for Egypt’s future. Last on the list is civilian control of the military. Just 26% say having a military under control of civilian leaders is very important. This is largely unchanged from the 27% registered in 2013, before the removal of Morsi from power. Generally, men are more likely than women to see the freedom to openly criticize the government and honest elections as very important, but on other items, there are fewer differences. Overall, these democratic values are shared across Egyptian society. About half of Egyptians (48%) agree that laws should strictly follow the teaching of the Quran. While this still represents the plurality opinion in Egypt, agreement with this principle is down 10 percentage points since 2013 and 14 points since 2011. Around a third (31%) say laws should follow the values and principles of Islam, but not strictly follow the Quran. Only 16% say that laws should not be influenced by the teachings of the Quran. However this is a significantly more common viewpoint today than three years ago. It was widely acknowledged that the Muslim Brotherhood-led Morsi government wanted to shape Egyptian society to more closely follow Islamist teachings. To that effect, Egyptians who have a favorable view of the Muslim Brotherhood are more likely to say that laws should strictly follow the Quran (56%), compared to those with an unfavorable view of the Brotherhood (43%). Similarly, those who oppose the July 2013 overthrow of the Morsi government are more likely to support a strict interpretation of Islam for their laws (55%) than those who favored the overthrow (45%).